Silas was loving all the excitement of food distribution day! On Tuesday we were blessed to be able to see God at work in a mighty way. 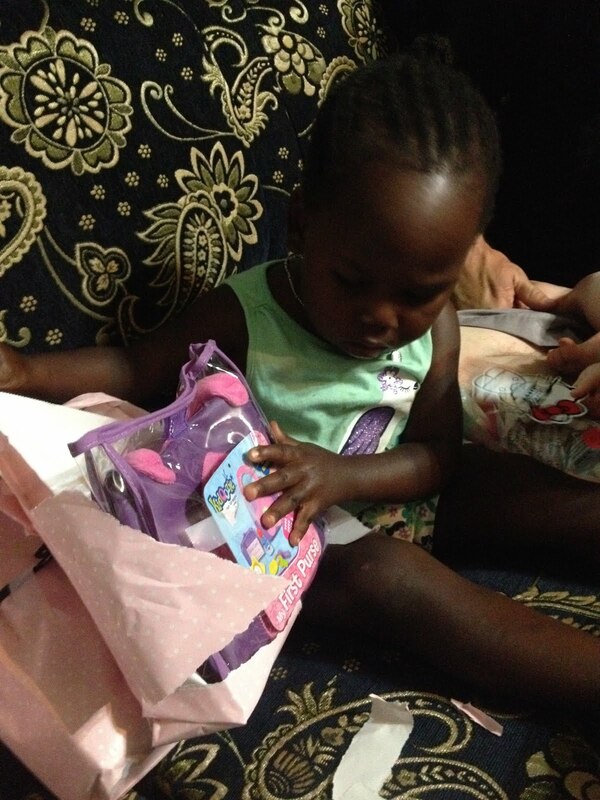 We watched in amazement as each home in our village of Obule received a 100 kgs. 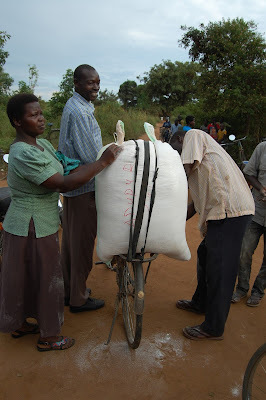 bag of maize flour. There were a couple months of prayer, planning, financial support, and logistics that went into making a food distribution of this scale possible. To get you up to speed on why a food distribution was even necessary you need to know that the majority of farmers in Uganda are one bad/missed rainy season away from famine. This year we've experienced drought throughout Uganda and much of East Africa. Most farmers are subsistence farmers so they grow what their family needs to eat and survive with little surplus. If there is a surplus that food is sold and the money used for school fees, medical expenses, and household needs. In drought, there is no yield so no crops so no food and certainly no surplus to be sold, so people have to buy food. Buying food is much more expensive than growing your own, but most folks are cash strapped. The drought has led to famine. In our area, homes are down to eating one meal a day and money to buy food is quickly becoming exhausted. the bags of flour protecting them from theivery. God is always at work around us, and through an intimate relationship with Him He invites us to join Him in the work is doing or planning to do. As we take a step of faith in obedience and align our lives to His will, we get to see Him work through us and around us in mighty ways. The recent food distribution was one of those experiences where we and the community got to see God at work. Feeding a village for a month is an undertaking larger than any of us, and larger than our local church. But God is certainly big enough and He allowed us to join Him in supplying material needs to several thousand hungry individuals. 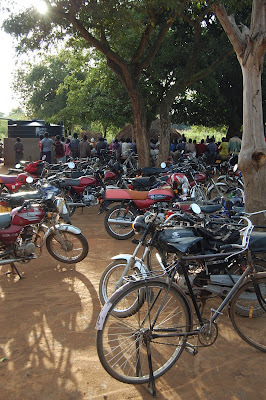 As the church leaders began discussions on how we to help the village, we began with prayer - lots of prayer, and God led the church leadership to try and provide a month's worth of food for the village. Roughly 600 homes are in the area. No one had done anything like this before and we at times felt overwhelmed by the sheer magnitude of the need and what was required to feed this many folks. Each home would receive 100 kgs. (220 lbs.) 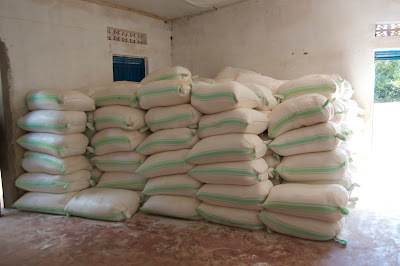 of maize flour that can be cooked as porridge or posho. Assuming each home has about 8 individuals we were looking at 4800 mouths to feed for a month. Personally I had some fear and trepidation as I focused on all that could go wrong, but a wise friend helped me to remember that God does not give us a spirit of fear but of power and love (2 Timothy 1:7), and He was calling us to love our neighbors. 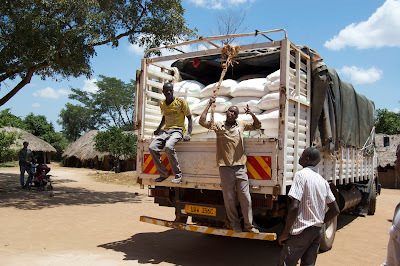 66 tons of maize flour is not cheap, but numerous friends and churches were willing to assist with the purchase of the food. 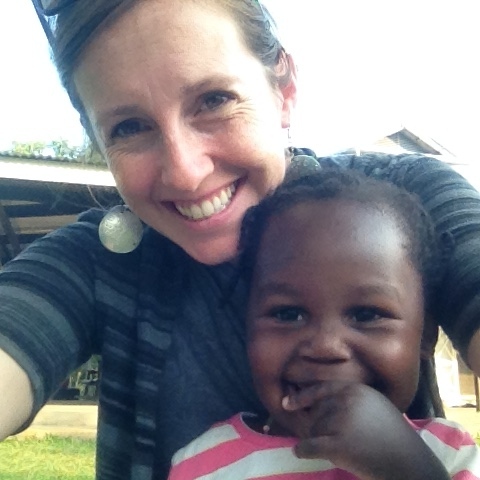 We are so grateful for your generosity. This would not have been possible without the financial assistance of so many. Once the call for help went out, you answered and within a week or so we were able to go to town and buy the 600 bags of flour needed. 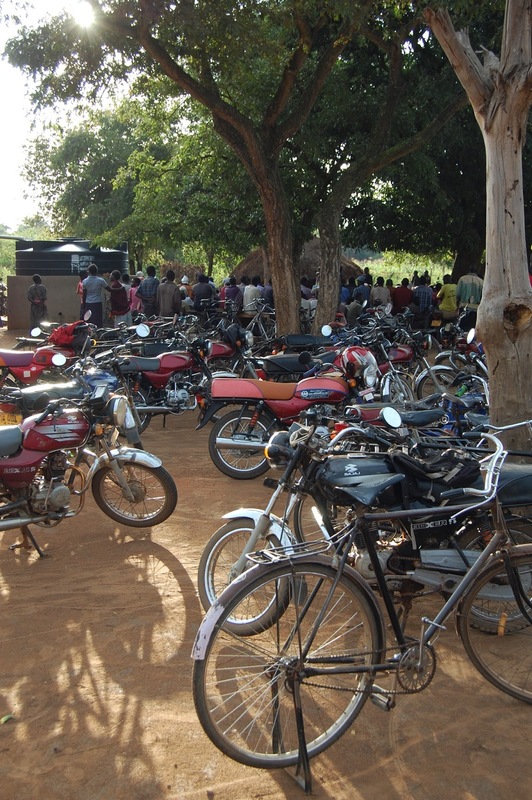 On the day of the distribution people walked, biked, and motorcycled from around the village and were at the church long before I was. Our friend Josh was able to share The Gospel with the crowd as they waited to receive their food. By 8 a.m. teams of helpers were calling names and handing out the bags. 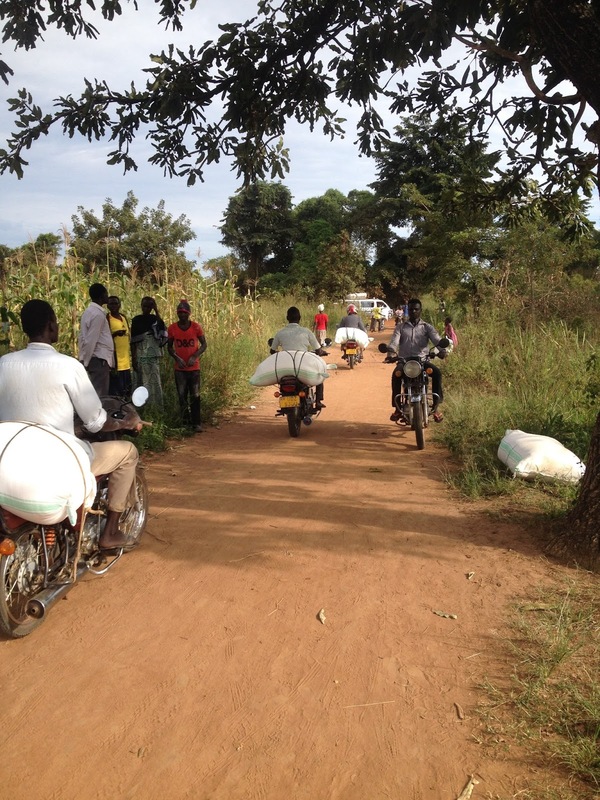 As people received their bag they loaded them onto the backs of bicycles and motorcycles and ferried them off to their homes. It was quite a sight to see a multitude of people milling around, visiting, and patiently waiting for their name to be called. Everything was so organized and efficient. None of the fears I'd had weeks before came to anything. So many people, so much excitement and joy, and so much relief as people knew they had food for awhile anyway. It was amazing to see. God allowed us to witness and play a role in a modern miracle as He fed a multitude. to their homes and back to the church for another run. There was so much joy on so many faces. Numerous people came up to me and exclaimed how good God is and were thanking Him. Our friend Dan said something to me the day before the distribution that really stuck with me. He said "Tomorrow will change the way people pray." I took that to mean after the distribution people's prayers will turn from crying out to God to help them to prayers of praise and thanksgiving as they saw God work to meet their needs. People saw God's love for them. We continue to pray for rain because people are in desperate need of a good growing season going into the long dry season that typically lasts from December to April. This food distribution will temporarily alleviate some of the strain families feel during this season of famine, but we need rain. Please pray along with us. Folks, we are in need of some prayer. The rains in this area stopped a few months ago during the most critical point in the growing season. The lack of rain and the heat has led to most crops failing. About two months ago Colin sat down with our pastors and they talked about what we were facing given that folks lost their crops. At that time Pastor Robert said that families were already down to eating just one meal a day. Things have gotten worse since that time. Most everyone in our village supports their family through agriculture. No one is a large-scale farmer, but has several small gardens of .25 to 1 acres in size. Families work together to care for and tend the gardens. There are very few "cash crops", so people grow "food" crops. These food crops are eaten and if there is enough left over it is sold for money, and that money goes to pay for medical care, school fees, expenses, buying other foodstuffs, clothes, and household items. In a year of drought like we are currently facing, none of the crops produce so people must resort to buying food. There is very little money to buy food, and when the little money you have must go towards food it cannot be spent on medical care and school fees - so other areas suffer. Food is expensive to buy and money is limited, so most homes are down to eating one meal per day. Things will only worsen if the drought continues and we experience more severe famine. Keep in mind that this is the final growing season before our extended dry season from Dec.-April. The church decided that we should help the 600 families in this village. We figured that each family has on average 6 children plus at least 2 adults. So with the number of families, we are looking at around 4800 people that are needing help. It was decried that the church should try to distribute food to each of the homes in this village. 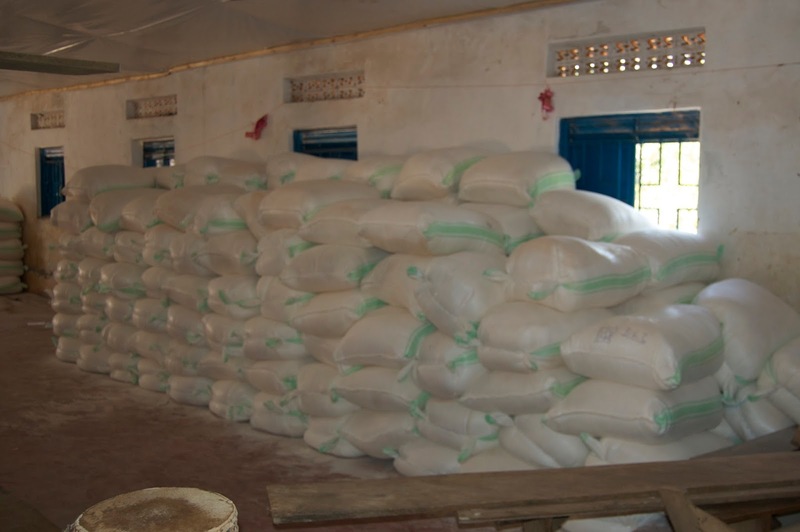 The food distributed should be enough to last the average-sized family for a month. There have been many meetings and lots of prayer over the best plan of action. We contacted our pastor in the U.S. along with some others and told them about what was going on and what we were thinking about doing. The response we received was great. However, Colin and I quickly started thinking of all that could go wrong with a major food distribution. But again, we were reminded by a couple that we admire and respect that fear is not from God. That even though this is a huge task, God is much bigger than all of it. So we kept moving forward. 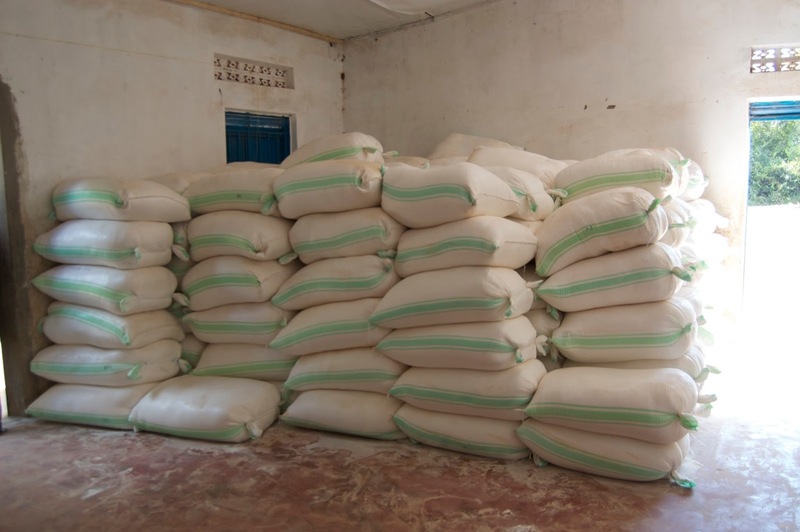 From the financial support that we have received thus far, we had enough to buy four hundred 100kg bags of posho (maize) flour. We are so thankful for that. But we are lacking the funds to buy the last 200 bags. The families in the area that are suffering due to the failed crops. They might be able to plant for the second rainy season, but it will be at least three months until they can harvest. Folks here are just one or two missed rains away from losing their crops. Almost everyone is a subsistence farmer. It leads to a sense of hopelessness and you can see it on the faces of folks. For the handing out of the 400 bags that we already have. Colin and I will not be the face of the distribution, but will allow the church to handle it. However, jealousy is a HUGE problem here. For the funds to come in so we can buy the last 200 bags of posho flour. Each bag cost $40.00 USD. And that God to be glorified through the whole process. Colin and I are so thankful for all the support we have received over the 4 + years that we have been here. We realize that as much as we would have liked to have been stateside at this time, we know that God has kept us here for such a time as this. And for that we are happy to serve. 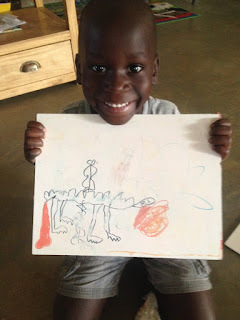 Silas loves to draw/color/paint. And he is pretty darn good for a 4 year old. I know that I am bias because I am his mom, but I don't care. He drew a picture of a fire breathing dragon a couple months ago and was very happy with himself. Up close of his dragon. I have kept lots of his little masterpieces that he has created over the last couple years. It has been so neat to see him love to do something. To develop a talent. I hope that whenever we do get to go to the U.S. we can get him into some sort of art class. His favorite things to draw are his family, airplanes, whales, and he just started drawing cats and dogs. The littlest of the Rosser family, Ms. Corrie, is 7 months old, loves to eat most everything I put in front of her, and is currently cutting her top two teeth. When she was cutting her bottom two teeth, her temperature went up like most children's do when their teeth are coming in. I checked her for malaria then just to be sure the fever was only because her teeth were pushing through. It was negative. This past week though, her temp went up again. 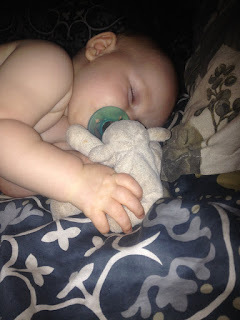 Her top gums are swollen and she is always chewing on her fingers. Naturally, I assumed it was just her teeth on top. 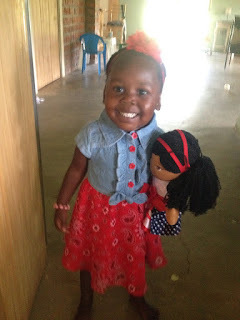 I took her with me to a friends house for Bible Study and we talked about how she was feeling because she was fussy. (And she is always fussy at Bible study...never fails!!) I even said that we should test her for malaria just to rule it out. Well...I should have that night. The next day her temperature kept going up and she was not herself. So I was the bad guy and poked her little chubby finger to get a drop of blood for the malaria test. Within a minute I could see the positive line showing up. DARN IT! I was going to start her on anti-malaria meds on Monday too! 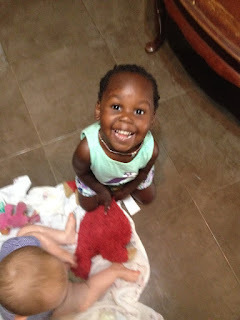 So not only was she dealing with her top teeth cutting in, but now she was going to have to flight off malaria as well. I was also able to send text to family (grandparents and aunts) knowing that they would all be pounding on Jesus's door on Corrie's behalf. After her first dose of meds. She slept on and off for the first two days. The way that the treatments work is that if you have malaria you start to feel so much worse the first day and into the second. The malaria parasites are trying their hardest not to die, and the treatment is killing them. As a result your body takes a beating from the inside out. It is so very important to drink lots during the treatment to flush out the dead parasites and the meds from your kidneys, and to keep you from getting very very dehydrated. Corrie hated the meds. She needed 15 ml once a day for three days. Worst. Thing. Ever. Ever. Ever! But we did it, she finished, and she is back to her normal happy self! 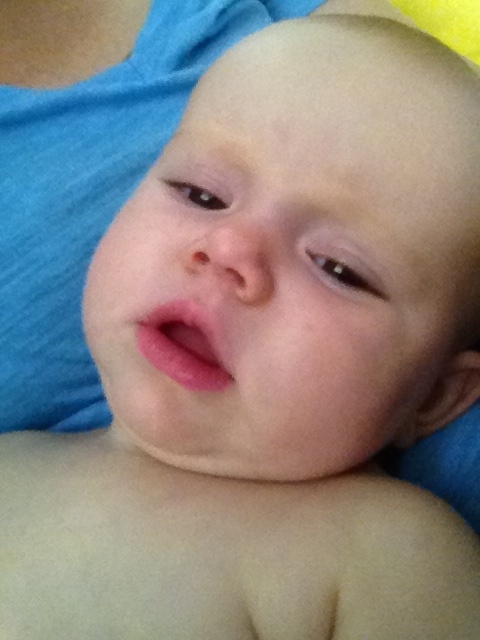 Well, aside from those two top teeth that are still causing her irritation. 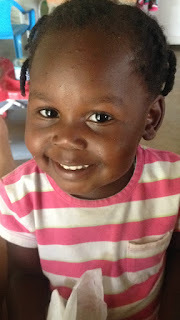 We thank God for healing Corrie and that we were able to get on top of the malaria and treat it so quickly. Last day of treatment and we had watermelon to celebrate! 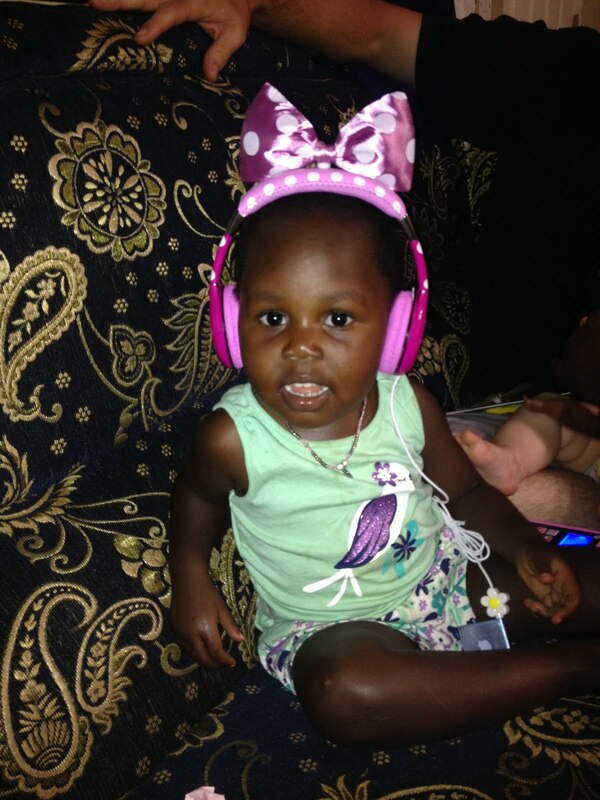 On the 8th of August, our little Aggie Darling turned 2. She is such a blessing to our family. Her personality is really starting to show itself, and I love it. We were in Kampala for her special day so she got to eat some yummy food and do some fun things in the city. She is very much loved by her Smother brother and little sis. 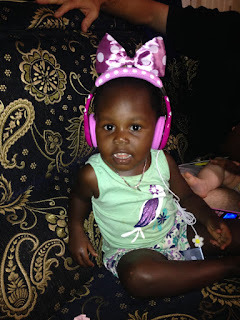 Her Kammy (my mom) sent her some new head phones because this little lady loves music. But, really, could she be any darn cuter?! That smile...Goodness. She is one happy little lady. She is a momma's girl and I am very much okay with that. I cannot wait to see what wonderful things this young, spirited little one will go on to do with her life. Happy 2nd Birthday Aggie Hayes Rosser!